Praise Jesus! Today is the last day of NaBloPoMo (National Blog Posting Month). Now, it's not as though I haven't enjoyed posting each day in the month of November. 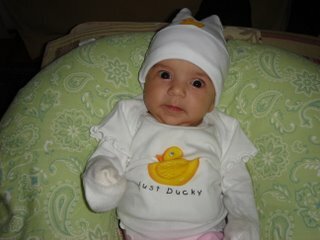 I have (most days anyway), and it's forced me to write this blog more consistently than I had been since Ella's birth. But the biggest regret I have about participating is that it left me less time to read all of your blogs. Between caring for the bean, working part-time (soon to be full-time, starting Monday, BUT, all from home! Yay! ), and writing here, I often felt neglectful in my blog-visiting. I read your blogs, but I often didn't have time to comment. But now, I'm back with a vengeance. Look for my comments all over tarnation now that NaBloPoMo is over. Thanks to each of you who came here to visit my blog faithfully each day. Especially when my posts were less-than-interesting. And I know there were plenty of those. I won't be posting every day anymore, but my goal is to post at least three to four times a week. Congrats to the rest of you successful NaBloPoMo participants, and also to those who gave it the old college try, but fell a wee bit short. I've enjoyed reading your daily posts, and getting to know you all a little bit better. And now, I think I may take a day or two off from posting. But I'll be back soon. 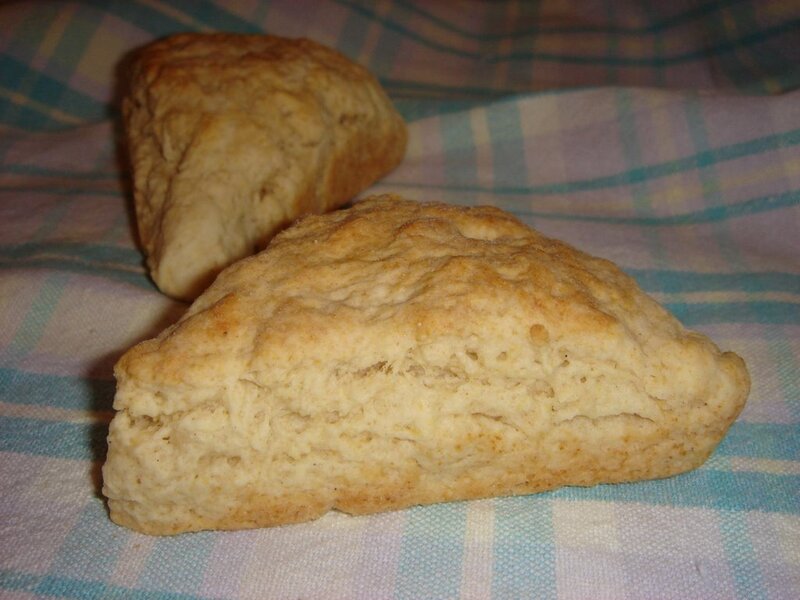 As has already been established on this blog, I am a scone fan. Love them, love them, love them. I believe this is probably because in general, they are a very bland breakfast treat (although I eat them at all times of the day), and they satisfy my sweet tooth with minimal baking effort on my part. So deep is my love that I even own my very own scone pan. I found this recipe for Vanilla and Ginger Scones on Baking Sheet. Nic is an amazing baker and puts all my efforts to shame. And her food photography, like Sher's, is amazing as well. And those Pumpkin Streusel Muffins Nic has up on her blog now? Are so coming home to mama's kitchen this weekend. Anyway, I omitted the candied ginger from Nic's recipe, because I'm not really a fan. And while I used my uber expensive vanilla paste, which I bought from an Italian import shop in Chelsea Market in NYC last year, because I couldn't find it anywhere here, you can use vanilla extract and achieve the same results. 1. Preheat oven to 400. 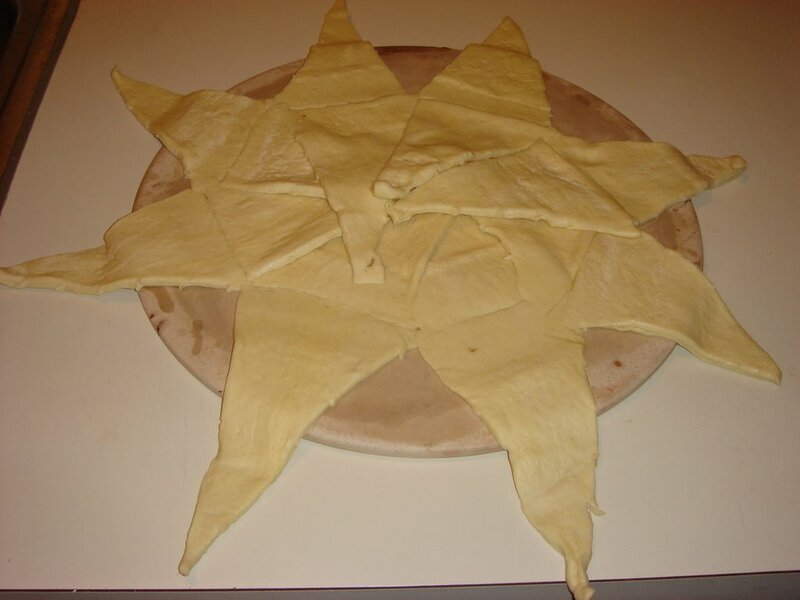 In a large bowl, combine flour, baking powder, salt, and sugar. 2. Add the butter to the flur mixture, and rub it in with your fingers, making crumbs. Keep working the flour in until the butter seems distributed, with a few larger bits, but nothing bigger than a pea. 3. Stir in 1/2 cup of milk and the ginger (if you're using it). Add the remaining milk 1 TBSP at a time until the dough comes together in a ball, but is not too sticky. 4. Knead dough gently into a ball on a lightly floured surface, then press it out into a 1/2 to 3/4 inch thick disc. 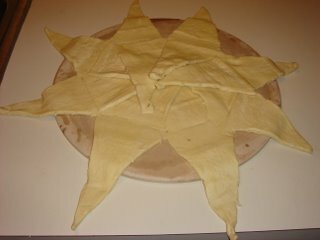 Cut the scones in the shape of your choice (triangular or circular), and place on a parchment-lined baking sheet. Or if you happen to be a scone geek like me, cut the scones into 8 equal trinages, and place in scone pan. 5. Bake for 14-15 minutes, or until scones are a light golden brown. Cool on a wire rack, or eat warm! My girl has officially outgrown her newborn diapers. The bean doth shat herself and soiled approximately eleventeen-hundred outfits this past weekend, and I finally deduced that the problem wasn't an explosive digestive system (although that's certainly a possibility, given my own digestive issues) but the fact that her newborn diapers were finally too small for her. They fit up to 10 pounds. Could my little girl weigh more than 10 pounds already? At her last doctor's visit in October, she was 9 pounds, 10 ounces. Which I thought was a lot. 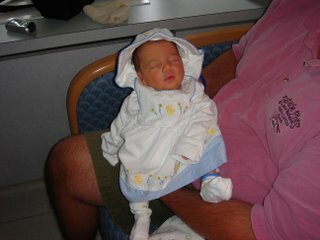 I mean, just the month before, she was 7 pounds, 1 ounce. When my cats gain that much, it's significant, because they don't weigh that much. And then the vet suggests diet food, and I feel like a bad cat parent. The same is true for babies right? So I stepped on the scale first and weighed myself first. Then I grabbed Isabella and stepped on the scale with her. According to my scale, she weighs 11 pounds! Can that be right? Now of course, my grandma thinks Isabella is the love child of Nicole Richie and Adrian Brody. She told me a few weeks ago, after telling me I should quit breastfeeding for about the millionth time, that her friend's daughter had a baby the day after I did, and that baby weighs 18 pounds now. 18 POUNDS??? Isn't that the weight of a second grader? Or at least a kindergartener, right? Someone out there tell me that my three-month old shouldn't weigh 18 pounds. And this past weekend, I realized she's outgrowing her newborn sleepers too. We were at my grandma's late, and I decided to put her in a sleeper I had brought so she could go right to bed when we got home. 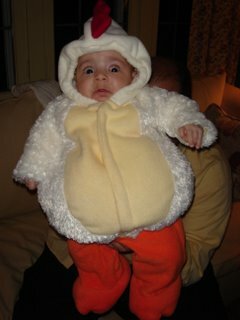 Well, poor Isabella resembled a stuffed sausage in that sleeper. Her toes must have been curled over inside the feet. I can't believe she's growing this quickly. 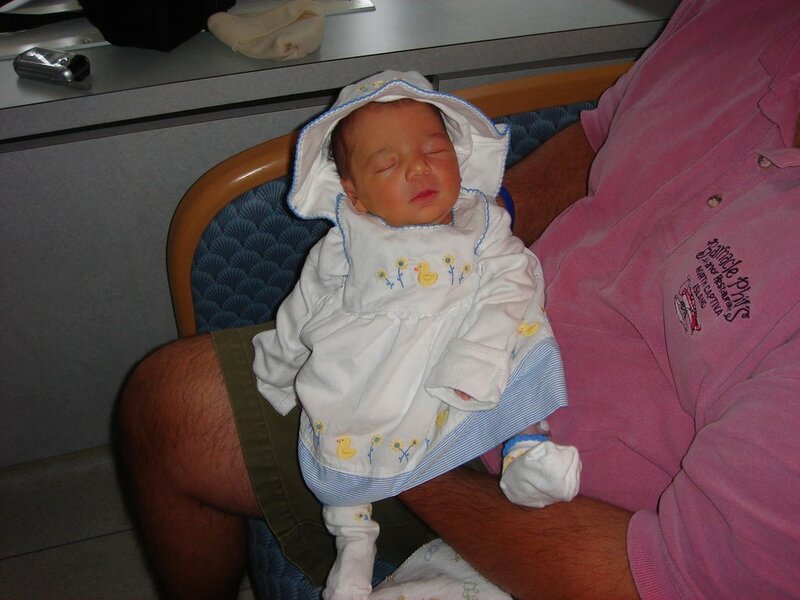 It seems like just yesterday we brought home a 6 pound, 3 ounce baby (she was born at 6 pounds, 10 ounces, and then lost 7 ounces). Now if you'll excuse me. Me of little upper body strength needs to go bench a few weights in preparation for carrying around my rapidly expanding daughter. The long Thanksgiving weekend is over. Rich has gone back to work after being off for five days. My mom and #4 have gone back home. And the last of the leftovers from my family's two Thanksgiving meals (yes, my relatives actually make enough for two full dinners on both Thursday and Friday) will be finished off today. There are 29 days until Christmas. And I am so not ready for the shopping madness that's about to ensue. If you're a frequent reader here, you know I come from a large and close family. Whom I love dearly. Except when they drive me nutty. And batty. But especially around the holidays, it's a wonderful thing to be surrounded by so many people who love you, who worship the very ground your daughter drools on, and whose cooking and baking form the basis of so many of your childhood Christmas memories that at times they're inextricable from the people themselves. The craziness, however, comes in the form of the sheer volume of gifts and the organization of the purchases for all these people. My sister and I split the cost of our family members' gifts. And the number of people we buy for each year? 11. And this number doesn't include the gifts we buy for each other (obviously), or the gifts we buy for other people (friends, co-workers, significant others) in our separate lives. Karrie lives 3,000 miles and three times zones away, so co-ordinating purchases for the 11 was often an electronic communication nightware. We'd send emails. We IM-ed each other. We'd try and contact eachother by phone to keep the other updated on potential gift ideas for this aunt or this grandma, but signals were crossed. Emails were deleted. And at times we'd end up with too many gifts for on person, and nothing for another. That's when Karrie came up with the spreadsheet idea. Yes, my friends, my sister and I now keep a meticulously updated Excel spreadsheet to track our family Christmas purchases. It includes two tables that track all the names of the people each of us is buying for, what we purchased for them, the total cost of the gifts, and a separate table for ideas for the remaining relatives to buy for. Each time one of us makes a purchase, we enter the details, and email the spreadsheet to the other. Yes, Christmas has been reduced to a spreadsheet. There's nothing I'd like more than to simplify and streamline my holiday gift-giving. I'd love to be able to handmake (or bake) gifts for some people with whom I normally exchange store-bought gifts, to both save money, and because I think these gifts are way more personal and special anyway. I want to take the stress out of the Christmas season, the stress that comes from hunting down gifts for so many people, and replace that stress with time spent with those individuals instead. But in reality, I have no idea how to do this. Do you have any suggestions? Something that's worked for you that's allowed you to enjoy the holidays without the stress (or with minimal stress)? If so, I need to know! 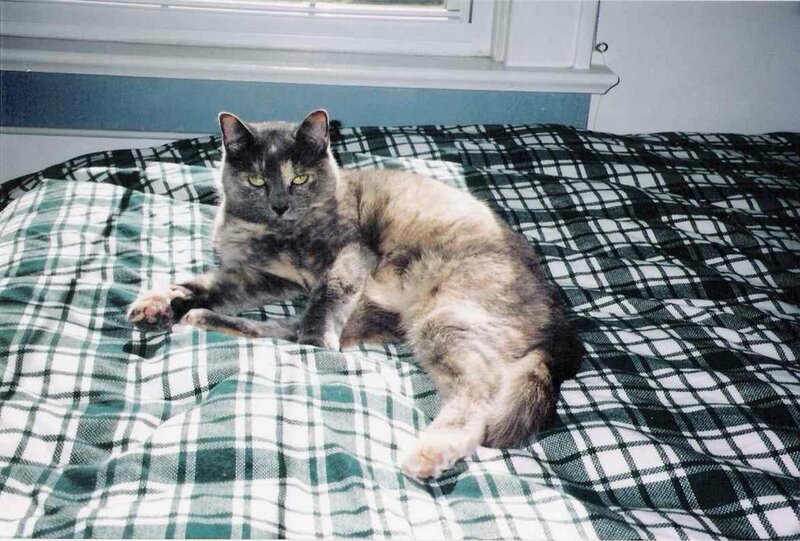 This is my very-late-in-the-weekend contribution to Weekend Cat Blogging. We had an amazing few days of unseasonably warm weather here in NY. It's been sunny and warm (well into the 60s, which is unheard of here in snow country in November). And Claudia likes to take advantage of any and all sunlight by working on her tan. And she doesn't use sunblock either. Thalia tagged me for this cooking meme. And I'm honored, because much like the over-perky and lately overtanned Rachael Ray likes to say, I am not a chef. I like to bake, pure and simple. And as we've already established here, I don't cook. 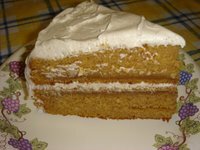 But I do like to write about my baking adventures. It's fun, and maybe something I make will inspire someone else to bake. And then maybe that person will inspire someone else, and so on, and we'll then have the makings of a made-for-tv movie on our hands, or at least a special The Food Network can play in the middle of the night when only freaks like me are watching. 1. Total number of cookbooks I've owned. I would say a very modest 20, tops. I love cookbooks, and if I truly let myself run wild, this number would be a lot higher. I tend to buy ones with great illustrations, and simple, easy-to-follow recipes for things (read: desserts and breakfast foods) that I'd actually eat myself. So there aren't a whole lot of chocolate cookbooks in my collection. Oh, and the number of cookbooks that contain recipes for something that could even in the vaguest definition constitute a complete meal? Two. Martha Stewart's Baking Handbook. I read this cookbook almost all the way through when I first received it as a gift last Christmas, and then again just a week ago as I was searching for pie recipes to make for my family's Thanksgiving. I ended up making her apple pie and her ricotta cheesecake. Both came out really well. And really, you can't go wrong with Martha. The Magnolia Bakery Cookbook by Jennifer Appel and Allysa Torey. After visiting this iconic bakery in NYC last year, I immediately returned home and bought their cookbook. The bakery is a tiny little thing, known for their amazing cupcakes, for which people stand in line, sometimes for hours. You can read my full review of my trip there here. And the cookbook is a collection of their greatest sweet treats, including the oatmeal muffins that taste so good you hardly realize you're eating something that's good for you, and recipes for enough old-fashioned cookies, cakes, and pies to clog your arteries and those of five of your closest friends in no time flat. Martha Stewart's Baking Handbook by The Divine Miss M, of course. 416 pages of vintage Martha perfection. I've made a ton of her recipes over the years, and I've never been steered wrong. Every baker should own this cookbook. Betty Crocker's Cookbook, circa 1973. This retro orange cookbook belonged to my mother. It's as much a part of my childhood as Sunday dinners at my grandma's and Cabbage Patch Kid tea parties. So many of the Christmas cookie recipes my mom used to make came from this worn and fragile cookbook, and when I got my first apartment, she gave it to me. Its recipes are wonderfully old-fashioned (soup-and-sausage casserole, anyone? 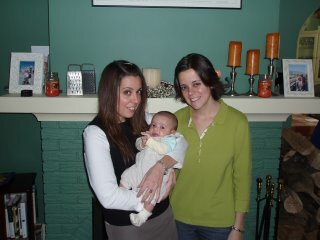 ), and it reminds me of growing up with my sister and my mom in our all-girl household. 5. Five people I'd like to see do this meme. No obligation, of course, but if you do end up doing it, let me know because I'd love to read your answers. Did someone say turkey? Tomorrow? Sweet. Feed me, Seymour! Mom just spent three hours making this pie, and during one of those hours, she was using words dad said I should ignore while she was making the crust. Think she'll mind if I take a face plant in it? Despite my innocent look, I am incredibly crafty. Mom doesn't know it yet, but I've just left her a surprise in my diaper. 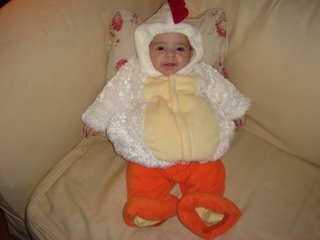 And this outfit that took a year and a day for her to dress me in? Will now have to come off. Mu...hahahahaha! 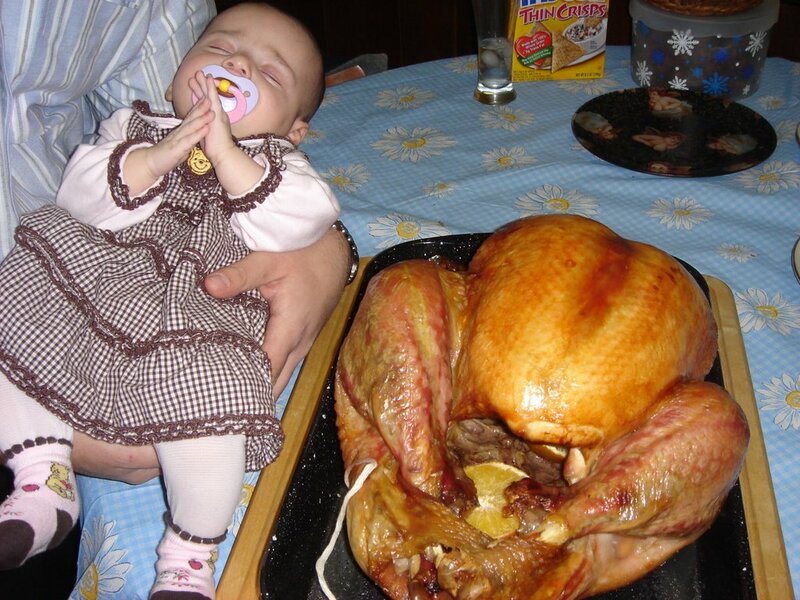 Dear Lord, So I know I dont have teeth yet, and all, but I really want some of this turkey. If you're listening, please let my relatives leave the kitchen so I can quit this sleeping act and dive into this bird. Amen. Thanksgiving has always been my favorite holiday. It's about family. It's about togetherness. It's about food. And other than the "Black Friday" shopping craziness that's advertised all over tv, it's not commercialized. There are no presents to buy. No parties to attend. No obligations to meet. You gather with the ones you love. You laugh. You catch up. You remember Thanksgivings of the past. You referee fights over who has surpassed his or her allotted time holding your three-month old, and then try to intervene before someone snaps your daughter's leg like the turkey's wishbone. Wait. You don't do that at your Thanksgiving dinners? Must just happen at mine, I guess. And of course, this Thanksgiving is extra-special, as we're sharing it for the first time with out little miracle of modern science. I'm so thankful for Isabella. I look at her every day and I still cannot believe she's mine. She's a true miracle, and I'm so grateful for the gift of motherhood that I've been given. I'm thankful for being able to share my life with a man who is both a good husband and a good father, who has more patience than three people put together, and who after almost 10 years together can still make me laugh every single day. 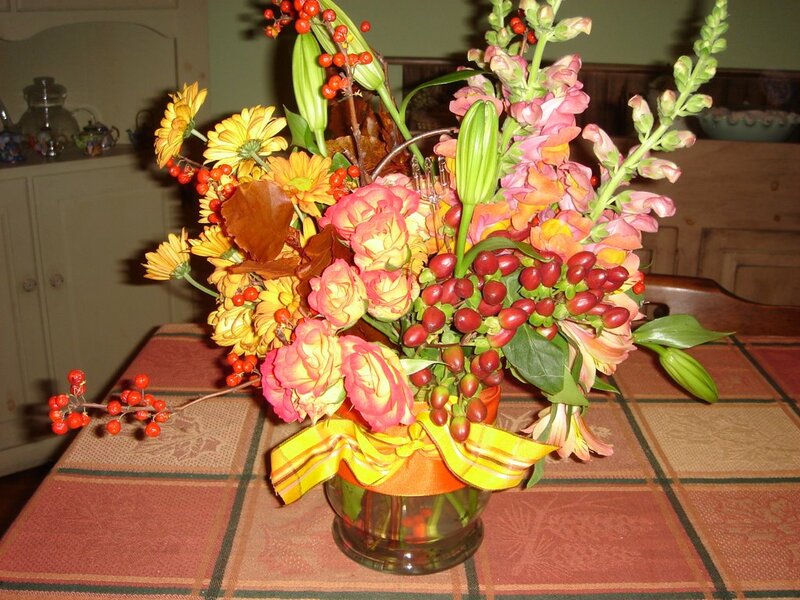 I'm thankful that a good friend received encouraging news from her doctor on Tuesday regarding some health problems. I'm thankful that my manager enthusiastically agreed to my revised "return to work" plan when I talked to him on Tuesday. He agreed to let me work from home full-time (no more cube-dwelling for me) and according to my own schedule (nights, weekends, and naptimes) so I can care for Isabella, and not have to be stuck home during business hours. I don't have to leave my baby. And I'm thankful for all of you who return day in and day out to read here. Your comments, support, and help are a daily mood-booster for me. Each of you is special to me, and I'm so glad we're pals in this great big blogosphere. Happy Thanksgiving, all! Eat lots! So I know ya'll are having turkey on Thursday. Unless you're my Aunt Karrie, who is likely having Tofurky instead. But I wonder if anyone reading here would like to make an exception this year. Would anyone consider having chicken instead? Wait! I didn't think anyone would take the offer! Please don't eat me! Did you ever ride The Gravitron at your town's carnival or fair? You enter this circular spaceship-like cabin. You stand against its walls. It spins in a circle, and you're pressed tight against the wall. And if you're particularly strong, you can move your body sideways or upsidedown, while gravity prevents you from killing yourself in the process. But the thing is, while you can move every which way against the wall, you can't separate from it. The gravitational force keeping you in place is too strong. This is how I feel most days. Stuck against the wall, with the hours racing by, and the to-do list I write myself at the beginning of every week neglected without progress. I juggle caring for Isabella, working part-time (soon to return to full-time), trying to scrap layers of dust off my furniture, and keeping up with the myriad tasks that fill daily life. I desperately need a 25th hour. Every day. 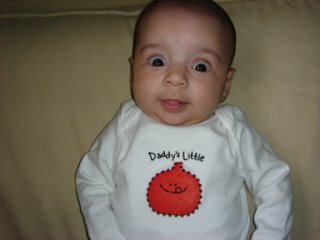 to this expressive, chatty, and increasingly mobile three-month old (tomorrow). We have "conversations" now. She's chats away with me all the time. And sometimes she chats to the cats. And sometimes she chats to nothing at all. She can hold rattles in her hand. She rolls to one side. She loves kicking and batting at her floor gym. She loves kicking her feet in her bath, and she loves kicking them on her changing table even more. She's a smiley girl too. Her ear-to-ear grins melt my heart, even at 3am when I'm bleary-eyed and desperate for my pillow and have to get up to feed her. And she's quickly outgrowing her basinett, which has sat two inches from my side of the bed since the day we brought her home from the hospital. I'm dreading the day when we have to move her to her crib in her nursery. I'm going to miss her being so close by. I am so blessed to be her mom. I can't imagine my life without her. And every day that I go to bed discouraged about the things I didn't accomplish that day because there simply weren't enough hours, I need to remind myself that I was able to accomplish something I never thought I would. I am a mother. I have a daughter. And sharing her life has made mine richer than I ever thought it could be. Thank you all so much for your support, advice, and offers of help in response to my post in which I detailed the realization that I cannot cook myself out of a cardboard box. I have the best readers on the planet. Seriously. So, I listened to you. I responded to M, asking her for the simple recipes she offered. Marie and Shannon told me to try some crockpot recipes, so I'm currently scouring the Internet for some good ones that will suit my fussy palatte. Dianne and Clare and Princess offered help with making baby food (yay! ), along with some easy recipes, and Sher pointed me in the direction of Nigella for some good kid-friendly recipes. And Sunshine, Caryl, and Christine made me feel a whole lot better about serving Isabella chicken and baked macaroni and cheese every night of the week! 1.) This week (or next), I'm hitting the bookstore to find a good resource for making baby food. 2.) I'm going to try and start to cook more often on my own, and rely less on my loving relations and the microwave. And you'll be so proud of me! I started this past weekend. It must be said that I am what you may call a Pampered Chef afficiando. Over the years, by attending others' parties, I do believe I have amassed half the catalog in PC-ware. The stuff is high-quality. It lasts forever. And I love the stoneware, because it never burns cookies. Ever! And now my friend Jenny is a consultant, which makes getting my PC fix easier than ever. So a few months ago, I bought a new PC cookbook called All the Best, which, as you might guess, has "all the best" PC recipes, from appetizers to main dishes to desserts. And though it was tempting, this weekend I did not bake a dessert. I made a main course! And my efforts didn't result in my house being burned to the ground either. I made a Chicken and Beef Taco Wreath. 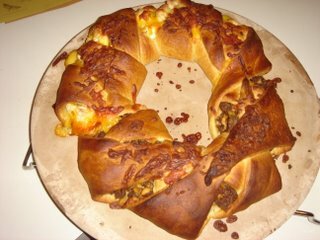 Half of the wreath (made of crescent rolls) was comprised of just chicken and cheese (for me), and the other half was beef taco for Rich. It was easy to make, except for the whole assembly of the wreath itself, which I believe would have gone a lot more smoothly if Isabella hadn't been screaming the entire time I was trying to figure out how to assemble it (she needed to eat too). But, either way, the finished product was delicious! This is a great recipe to make if you're having a holiday party, because if you do it correctly (which I did not) it looks mighty impressive. And either way, I'm proud of myself for giving it a shot. This is definitely something I wouldn't have attempted in the past. But the time has come for me to give cooking a shot, people! I can do it, right? 1.) Preheat oven to 375 degrees. Cook ground beef until no longer pink, and break beef into crumbles. 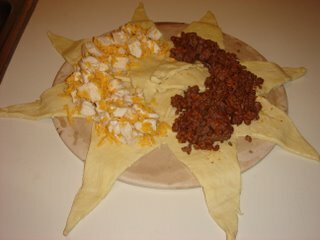 Drain, and then stir in taco mix, most of the cheese, and the water. Set aside. (I'll give you the recipe for Chicken Club, although I omitted all the ingredients except chicken and cheese. I know. Freakish. Baby steps, people. Baby steps. 1.) Combine chicken, bacon, most of the cheese, mayo, mustard, parsley, and garlic. Mix well. Then, roll over the seams where the trianges meet to create a smooth surface. Scoop the filling evenly over the dough in a continuous circle. Now comes the part where I didn't do it exactly as I should have. You're supposed to create a wreath pattern by bringing up the edges. I didn't have the time, patience, or attention-span to perfect this, so I just did it my own way, which I think turned out fine. If you're going to try this, and want to do it correctly, let me know and I'll email you the proper directions. So I cooked! Yay for me! This is Chubbie and Claudia. Chubbie is Claudia's mom, and like many mothers and their middle-aged daughters, they sometimes don't get along. Chubbie will hiss at Claudia when Claudia gets too close. Claudia will move in for some mom-lovin', and most often, Chubbie wants no part of it. 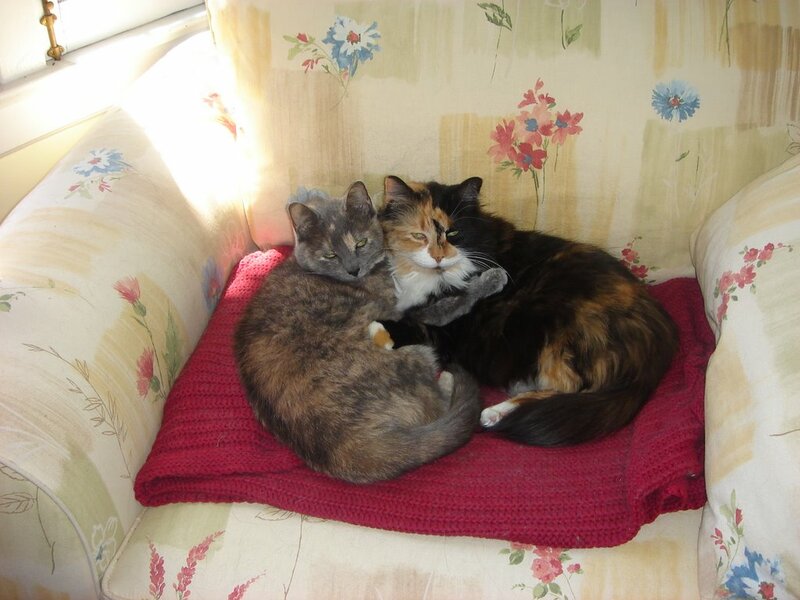 But on this day, they followed Brooke Shields and Tom Cruise's lead and put their differences aside, and wrapped their paws around eachother in a sweet and loving embrace. 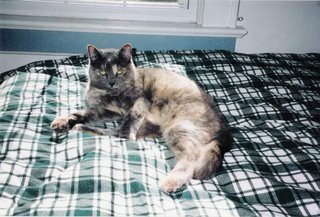 Then Chubbie told Claudia she ought to be taking vitamins instead of prescription medicine to avoid coughing up hairballs, and it was over almost before it began. Several news stories along with a few things I've come across in my own life this week have left me confused. Now, this state of mind is nothing new for me, of course. And especially now, considering the fact that I've figured I'm at least 22% dumber now than I was before Isabella was born. Babies. They eat your brain cells. I'm totally convinced of this. Let's start with the Pope this week reaffirming the fact that Catholic priests must remain celibate and are not allowed to get married. The Catholic Church is in crisis mode. The number of ordained priests is dwindling. Churches all over the United States are having to shut their doors because there aren't enough priests to keep them open. And people are leaving the church in huge numbers (for a whole host of other reasons). But according to the Pope, priests cannot get married, and if they were, I believe there would be many, many more men taking vows. So why is this? I don't understand how having a wife would negatively impact the life of a priest. I believe it would only enhance their lives, enable them to more closely relate to their parishoners, many of whom are married, and enable them to more fully participate in the Church by receiving a sacrament to this point they've been unable to receive. This is just another example of the Vatican showing how truly out of touch it is with the modern world. And then we have this little gem from my favorite person in the world, Michael Savage. How can one person be filled with so much hate? And the most terrifying aspect of the venom this man spews on a daily basis is that he has 8 million listeners. 8 million Americans are listening to this man's hate speech. 8 million. And if that doesn't scare you, nothing will. Okay, I'm stepping off my political soapbox now and moving on to a few lighter topics. As every baker worth her weight in flour, butter, and eggs does, I own the bible. And in looking through it the other day to find some recipes for the pies I'm making for Thanksgiving, I came across a recipe for New York-style Cheesecake. Expecting to see a recipe that included the traditional cream cheese filling atop a graham cracker crust, I was surprised to see that the crust actually called for crushed chocolate wafer sandwich cookies (essentially Oreos). A chocolate crust in a cheesecake? I don't get it. I've never heard of this before, and I've had cheesecake in NYC that didn't have this crust. So color me confused. Anyone know why this is called New York-style cheesecake? can turn into the demon spawn of el diablo with absolutely no warning? Thursday was the day from hell. She was cranky all day. And all night. Crying for no reason. Wanting to be held almost constantly, and even then she was fidgety and out-of-sorts. Sleep and I broke up that night, and it was not an amicable split. I called a lactation consultant because she wasn't nursing properly, and she said she was going through a growth spurt, which can cause all kinds of bizarro behavior. 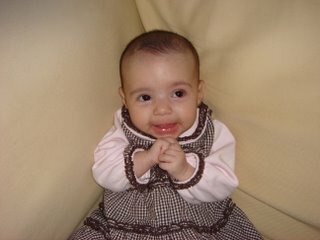 Oh please, God, please let her stop growing now. I don't care if she stays 23 inches long forever. Mama needs her sleep. And finally, this. How is it that mothers sit bolt upright in bed the nanosecond their children start to cry, and begin to respond immediately, but if you lay a screaming child down in bed next to his or her sleeping father, dear old dad keeps slumbering away in peace? I truly believe this is either one of life's great mysteries, or a con act whose techniques of pulling it off have been passed down from father to father throughout the ages. If anyone can answer this one for me, I would really be grateful. Take one cranky 12-week old going through a growth spurt, and who has been slightly to moderately miserable much of the time for the last day or so. Mix in one exhausted and sleep-deprived mother. Bake for 24 hours and counting. And you have this poor excuse for a post. I'll be back tomorrow with something worth reading. For the past week or so, I've been watching The Food Network's myriad Thanksgiving-themed shows. Racheal has shown me how to cook an entire Thanksgiving dinner in 60 (not 30) minutes. Giada taught me how to add some Italian influences to the sides that accompany the big meal a week from today. I even learned how to stick leaves from trees under my big ol' bird to make it look pretty (as if anyone would want to do that, because seriously? Ick.) from Sandra. And last night I watched four accomplished chefs compete in the Thanksgiving Food Network Challenge competition. In watching all of these shows, it's really hit home for me the very pathetic fact that at 30 years of age, I cannot cook. As in, not at all. As in, not even a little bit. So, okay. I can make Baked Macaroni and Cheese. And I can toast a mean piece of bread. But seriously people? That's the extent of it. Of course this is tied to the fact that I'm an extremely picky eater, and have been since I was young. I had ulcerative colitis growing up (and I have Crohn's Disease now), so food and my stomach and intestines have a bit of a checkered past. I couldn't eat a lot of vegetables growing up, since they were hard for me to digest. Same goes for spicy foods, or foods with intense flavor. So I stuck with the boring and the bland, and that carried me through to adulthood. Couple that with extremely indulgent and fantastic cooks in my family, and Sunday dinners at my great aunt's that keep Rich and I in leftovers until at least Tuesday, and you have 99% of the reason that I can't cook a complete meal to save my life. But watching the Food Network as often as I do has really made me wish I could. The personalities make it look so easy. All that chopping and dicing with super-sharp knives? What a stress-reliever! And those gadgets-the mandolin, the garlic press, and the food processor. Fun stuff! Reading some of your amazing food blogs (Sher and Dawn, I'm looking at you) has made this desire even more strong. And then of course there's the terrifying realization that in a little over a year, I'm going to be responsible for nourishing another human being with food that I can't produce by simply doing nothing at all. What in hell's bells am I going to do about cooking for Ella? In the short term, I want to research how to make her baby food for her, so as to avoid the preservatives and chemicals in jarred food. But in the long term? I. Am. In. Serious. Trouble. Then again, I think I'll be pretty popular with her. Finish up your brownies and ice cream, Ella, or you won't get any dessert. And mommy made peanut butter cookies, so I better see a clean plate! Yesterday I went to the mall. And okay, so my home isn't Alcatraz. I actually quite like my house. But the mall trip was a stealth operation from start to finish all the same. Because...wait for it...I took Isabella with me. And in doing so, I violated Rule #5. In a big way. 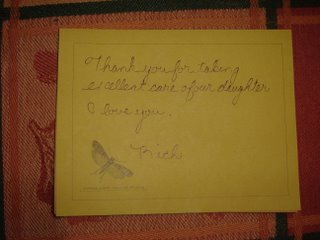 If you've been reading here awhile, you know I have some wonderful, loving, and giving relatives. Who are also a scant bit overprotective (some might call it neurotic) when it comes to Isabella and slightly critical of my parenting skills (or what they might call the lack thereof). On Monday my grandma was here. I told her I had to go to the bank the following day (yesterday). She said, "Okay, if I don't have to work, I'll come over and watch Isabella." You see, the thought never occured to her that I could very easily and without any trauma to my child take her to the bank with me. And I didn't even have to go in, people! I was going through the drive-thru! Well, it turns out grandma had to work yesterday, and she called to tell me so Monday night. She then said she'd tell my great aunt to come over to watch Isabella so I could go to the bank. I told her that wasn't necessary, and that Rich could go to the bank on his way home from work (a lie, of course, because I had every intention of going to the damn bank myself with Isabella in tow). She said okay, but then 10 minutes later my great aunt calls and says she's coming over the following day so I could go to the bank. Seems grandma called her anyway to cover all her bases so that there was no possible way Isabella could set foot one inch outside my house. She will stay inside forever or she will die! So I informed my aunt that no, Rich was going to the bank for me, and no, I didn't need her to come all the way over to my house to watch Isabella so I could run a 10 minute errand. Little did grandma and auntie know what I really had planned for yesterday. Not only did I take Isabella with me to the bank (Gasp! ), but we went to the mall, where we met my friend for lunch and shopping. And a heavily bundled Ella was outside in her stroller for approximately one minute between the car and the mall door (The Horror!). And there were other people there. People with germs (Dear God, When Will It End?). And now for the most horrible part of the whole trip. I nursed her in the Mothercare Room, which incidentally I didn't know existed until my friend told me about it. What a cool thing. I can go to the mall now and not have to run home after two hours to feed the babe! And through the entire trip, which start to finish lasted about 4 hours, I felt like a 15 year old girl who climbed out her bedroom window at midnight to meet her boyfriend at the park down the street. What if one of my grandma's friends saw me at the mall? What if she unexpectedly shows up at my house after work and we're not there? And how many frantic answering machine messages inquiring as to my whereabouts would I have when I got home? The trip to the mall was lovely. I got out of the house, which I don't often do. My friend and I both drank pumpkin spice lattes from Starbucks, which is like a hug in a cup for me. And I bought the girl some cute clothes. We even helped a frazzled and hormonal new mom get her baby's carrier into her stroller after she ran up to us asking for help. And when I got home? Not one message from grandma. Not one message from auntie. These arrived at my house yesterday afternoon. 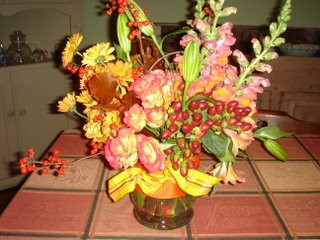 And yes, I'll have you know I'm one of those girls who can be won over with flowers. This concludes the "really sweet" portion of this post. Now on to the really gross part of our show. Have you all seen these advertised on TV? I don't think a more disgusting food item exists on the planet. Apparently, they are "layers" of said company's "flavors" in a single, allegedly "famous" bowl. Because seriously, what's more appetizing that mashed potatoes, layered with corn, layered with chicken, and then topped with gravy and cheese? That's like a heart attack in a dish. Now, I like all these things separately (except maybe the gravy) but all thrown together in one bowl? Retch. Has anyone ever had one of these? And if you haven't, would you try one? I've said many times since August how the arrival of one tiny little person has brought such incredible and multi-layed change to my life. Where my days before the "Beastie" were filled entirely by choices I made for myself regarding what I chose to do and when I chose to do it, my days now are dictated by fulfilling Ella's needs according to Ella's schedule. I feed her 8-9 times a day. I change her diaper at least as many times. I give her baths. I read to her. I talk to her constantly. I take several millions photos of her. And I hold her, and kiss her, and love her. And I wouldn't have it any other way. But circumstances are such now that I have to straddle both worlds: my pre-baby world, and my current one. A few weeks ago my manager called to tell me that he fired my maternity leave replacement. Apparently, she was a wee bit crazy, horribly incompetant, and, in his words, "not me." So he let her go. And he asked me if I would consider doing some part-time work before I return full-time in December. The last thing I wanted to do was say yes. 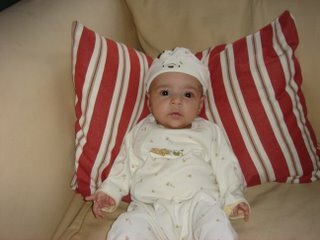 My 15 weeks of maternity leave were supposed to be about devoting myself completely to my baby. I wanted nothing to interfere with this, least of all my job. And, if you've been reading here for awhile, you know that my goal now is to quit and stay home with Isabella. It's been my central focus since realizing this to find a way to somehow make this work. But I told my manager I'd think about it. And I did. A lot. I realized that if I did him this favor (and he made it clear how grateful he would be if I came back), he might be more inclined to return the good deed when I tell him what I want in terms of a schedule when I return full-time in December. So I agreed to come back part-time, as long as I could work my own hours (meaning nights, weekends, and whenever Ella is sleeping), and not have to come into the office, which is also what I'll be proposing to him come December. He was overjoyed and agreed to my terms immediately. So I'm working 16 hours a week now, from home, until December when I return to 40 hours a week. I've had to go into the office a few times since agreeing to work part-time. I picked up a new laptop they gave me. I dropped off my manager's birthday gift. And it truly feels like I'm walking on another planet. It's the same office. The same people. The same nasty coffee in the kitchen. The same water-stained drop ceiling tiles. My cube is the way I left it as well. It's the same space I spent three days a week in for the past two years. And yet the entire place couldn't have been more irrelevant to me. I didn't feel like I belonged there anymore. It didn't feel like my workspace. It was a completely foreign environment. I felt wholly disconnected. My connection now is to my baby and to my home. I work for Isabella and my workspace is her nursery, her changing table, and the big yellow chair I feed her in. Every night, after the bean goes to bed, I have to re-enter my former world when I switch on my laptop and work. But my heart isn't in it. And my mind? Isn't in it either. And trying to write marketing copy that's interesting, smart, and attention-grabbing after caring for an infant all day is seriously and completely hard. And draining. And exhausting. All I want is my pillow at 9pm when we put her to bed. This face is all that's relevant to me now. And somehow I've got to find a way to keep it that way. My three cats have adapted pretty well to Isabella. They don't really come near her. They sniff her sometimes, but that's the extent of their interest. Her furniture, of course, is another story. Here we have Ella posing with Claudia. Claudia wishes Ella wouldn't mess with her either. I don't often use this blog to promote products I like. Sure, ya'll know I love my Kitchenaid mixer I received for Christmas last year. And I love my way-too-expensive Citizens I bought last year in Seattle (and hallejeuh! They fit me again!). But I can't have my loyal readers thinking I stand to gain anything by promoting these products. I need to maintain my credibility. I'm fair and balanced. Just like Faux, er, Fox News. But I would be remiss if I didn't let you know about a fantastic product I discovered last night. 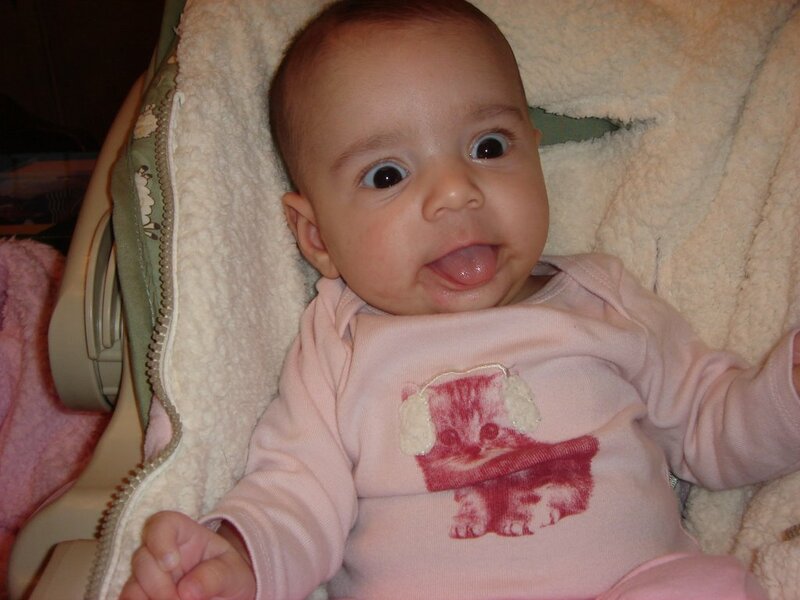 I was nursing Ella at 4 am, and there it was, on a TV infomercial for the world to see. My friends, I'm talking about this product. What's GeMag*c, you ask? Well, it's simply the easiest and most impressive way I've ever come across to add some sparkle to my life. And it appears to be a breeze to use. Take the tool, load in the rhinestones or stars of your choice, and bedazzle your entire wardrobe! Those plain blue Citizen jeans I spoke of? I can add a dazzling geometric pattern up and down one leg (or both!) and suddenly they've gone from drab to fab. The helpful host even told me last night I could add some shimmer to my pillowcases, to add a whole different kind of excitement to my bedroom. And who woulda thunk it would be so easy to add a shiny red, white, and blue flag to the back of my jean jacket in just two easy steps? God Bless America indeed! The only thing I can't understand is why they put this fantastic product infomercial on in the middle of the night, when only insomniacs and nursing mothers are awake to see it. Then again, perhaps the marketers realize we're the subset of the population who needs the excitement of bedazzling our lives the most. Perhaps one of the reasons I have such an obsession with the one and only Paula Deen and her recipes is because I really should have been born in the South. Now, my political beliefs certainly don't align with the red states. And I'm a high-strung, race-through-life East Coast girl though and through. But my taste buds? I think they're firmly rooted in the lower half of this awesome country of ours that gave control of Congress to the Democrats this week! Woot! Holla! Hurray! Okay, getting back on topic. I love me some barbeque. I love cornbread. And I love fried chicken. But my number one Southern comfort food of choice is macaroni and cheese. I *heart* macaroni and cheese like nobody's business. I order it when we go out for barbeque all the time. But the best macaroni and cheese I've ever had comes from my stepmother's recipe. Now, I'll warn you. It takes awhile to make. There's a lot of stirring of the cheese sauce involved. But trust me when I tell you the end product is worth waiting for. 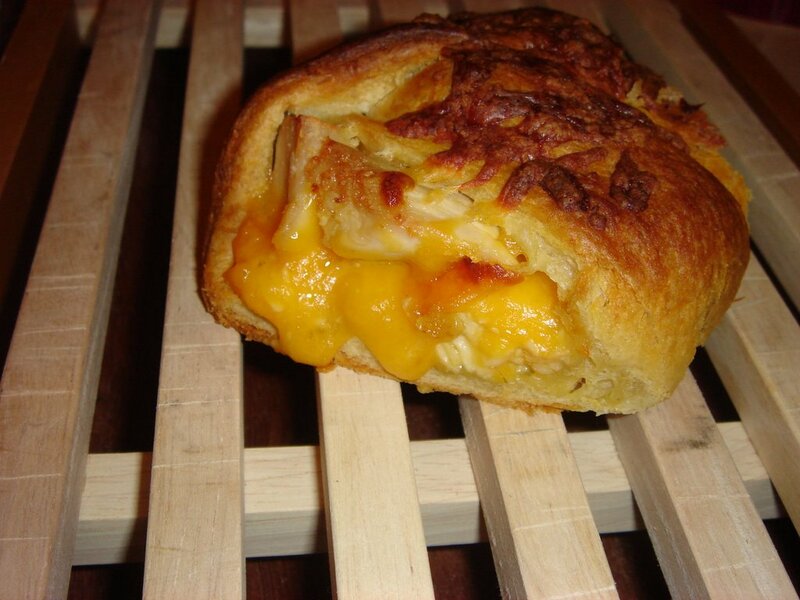 It has loads of flavor, tons of cheese, and is very filling. And while I generally make an attempt to eat as healthfully as possible, this macaroni and cheese? Is not. But it makes a great once-and-awhile indulgence. 1. Cook macaroni according to package directions, drain well, and place in 2-quart cassarole dish that's been sprayed with cooking spray. 3. Melt butter in medium sauce pan, remove from heat. Slowly add flour and salt and pepper. Return pan to medium heat, and slowly add milk, and start stirring (about 15 minutes) until mixture is smooth and thickened. 4. Add cheese, onion, and Worchestershire sauce, stirring constantly over low-medium heat until cheese melts and gets thick. 5. 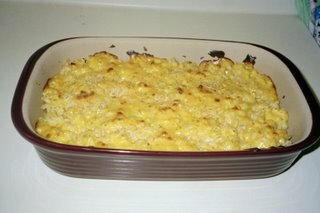 Pour cheese mixture over macaroni, top with breadcrumbs, and bake about 25 minutes, or until top is browned. I usually make a double batch because it tastes equally good reheated for leftovers. 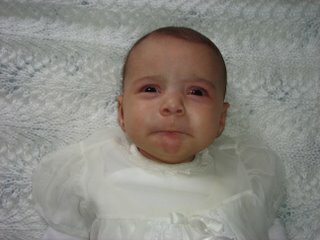 When Isabella first came home from the hospital, she was waking up every two-to-three hours during the night to eat. It was hard on me, but still being new at the whole motherhood gig, I hauled my arse out of bed, picked her up from her bassinet where she sleeps beside me, cradled her lovingly in my arms and walked with her to her nursery next door. There I rocked her gently in the glider we bought especially for this purpose, and lovingly sang such diddies as "You Are My Sunshine" and the Beach Boys' "God Only Knows" to her as I stroked her head and nursed her. It took me falling asleep on the job a few times to realize that this was not an effective way to nurse my daughter at 3 am, 'cause she may roll off my lap and onto the floor. So I switched tactics. I still cradled. I still walked next door to her nursery. I still rocked her in the glider, but I then tried reading magazines to stay awake while I fed her. And while I love my Martha with every craft-challenged fiber of my being, somehow learning how to refinish an old Windsor chair while the rest of the world lies sleeping wasn't doing much to keep the old eyeballs open either. So now comes the portion of our show in which I admit what I'm now doing while feeding my daughter in the middle of the night. 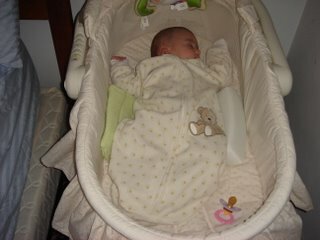 I still cradle her, however it's for a much shorter time period, as I no longer schlep over to her nursery. I feed her in my bed now. With the tv on. And what do I watch, you ask? Educational documentaries on how to raise a child who will always read above her grade level? Nope, sorry. Those aren't on in the middle of the night. Cooking shows on my favorite tv channel, The Food Network? Most often, no, as the little one has the habit of waking up most often when Emeril is on, and Emeril and I do not get along. No, you see my late-night tv-viewing is far more base than any of these. When I'm feeding my daughter, I'm usually watching The Maury Povich Show. I know. It's a terrible guilty pleasure for which I'm currently seeking treatment. And yes, I know, the Maury Show is barely a hair's breath away from the likes of The Jerry Springer Show in terms of the number of on-stage fist-fights and chairs breaking over guests' heads. But it's entertaining, people! The guests? 99% of them are certifiably crazy. And the show topics? Well, those are entertaining enough to keep me awake through the longest nursing session. Recent favorites of mine include "I'll Prove My Baby is Your 14th Child" and "Is My Boyfriend or His 44 Year-Old Uncle My Baby's Father?" And the paternity test results? I'm telling you, they keep you on the edge of your seat, er, bed. I'm praying to God Ella isn't listening to the Maury Show along with me, because if she is, I'll have plenty of 'splaining to do to her psychotherapist one day. Last night, the citizens of this fine country gave our dear President a much-needed and long overdue kick in the arse. They stood together and gave Democrats control of the House, and it looks like the Senate as well, assuming Montana and Virginia stay blue, as they appear to be now. But this election was about more than giving back control of Congress to the Democrats. This election served as a referendum to W. A referendum that said that we as Americans are sick of Republican corruption and scandel. We are fed up with the theocracy he has so desperately tried to create in this country that was built on the separation of church and state. And we are outraged at his gross mishandling of the Iraq war. This country now has its very first female Speaker of the House in Nancy Pelosi. Dennis Hastert (or Shrek, as I like to call him) can now retreat quietly into whatever dark forest he emerged from. And while Colorado sadly voted against legalizing domestic partnerships and for defining marriage as between a man and a woman, more progressive Missourians voted to protect embryonic stem cell research, both in a ballot amendment, and by electing Claire McCaskill. 2008 is still two years away. But for the first time in a long time, I feel better about the direction in which this country is headed. So, what did you think of last night's results? 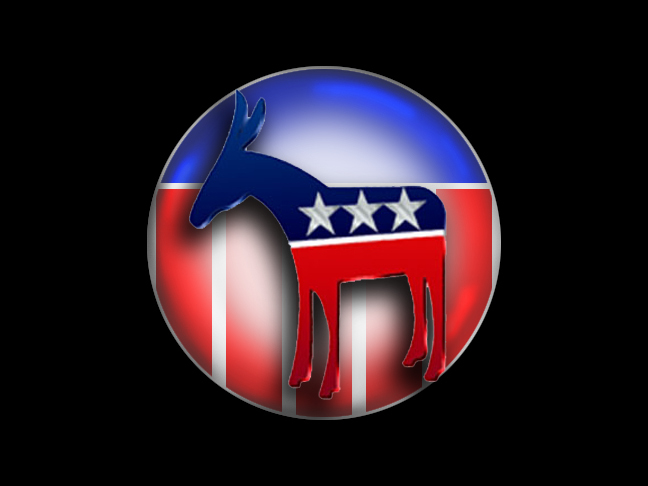 It's Election Day, and although I'm a political news junkie, I can't recall ever being as interested in a midterm election than I am in this year's because of what's at stake. Democrats can take over control of the House with just 15 seats, and they can take control of the Senate with just 6 seats. And with these victories, there can finally be somewhat of a system of checks and balances run on the worst president this country has ever had. Perhaps we as a country will finally witness an end to our president legislating morality from within the walls of 1600 Pennsylvania Avenue. Perhaps we'll finally see the focus of our country move beyond what goes on in the bedrooms of American adults, beyond what medical procedures women choose to have performed on their bodies, and beyond what options couples have for disposing of the byproducts of their infertility treatments. And perhaps the focus will shift to what's really important: closing the gap that exists between the wealthy and the very poor of this country, which is widening every day. Taking personal responsibility for how each one of our actions impacts the global environment, which is deteriorating at an alarming pace. And perhaps most importantly, designing an exit strategy for getting our men and women out of Iraq. Now. Before one more solider is killed in a war we never should have been fighting in the first place. I will vote today for a change. Will you? 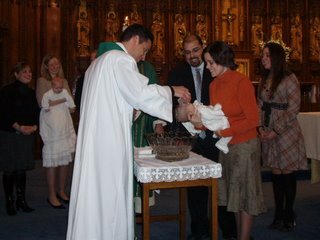 Yesterday Isabella was baptized. Godmother Karrie came from 3,000 miles away to celebrate with her neice. 30 of her relatives packed the first four pews in church and did their best to recreate the Ellapalozza pre-birth waiting room scenario as they jockeyed for position to get the best photographs, the cutest smile, or most coveted of all, the longest time in their arms from my girl. The babe was a perfect angel and slept through the entire holy water head bath she received. Perhaps she was exhaused from the fashion show we put her through before the main event. If being the United States' first female president doesn't work out for her, I believe the sisterhood just might be a viable option for her. 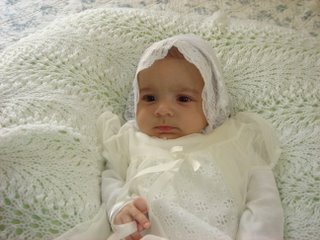 Here, Isabella channels her best Fraulein Maria from The Sound of Music. Sing it with me, "The hills are alive......"
And here we have Isabella bearing an eery resemblance to this creature. This is how she actually looked yesterday. 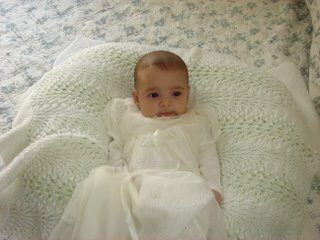 She was wearing the same dress I was baptized in 30 years ago. In fact, we're about the same age (10 weeks) in the two pictures below. And shortly after these pictures were taken, poor Isabella's patience wore out. You might remember that prior to Isabella's birth, we had a small problem with the cats sleeping on all her furniture. At times we caught them red-handed. At times, they left their hair as their calling cards. And at all times, they were unapologetic. 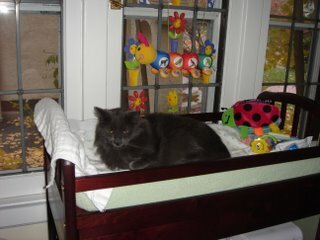 Here we have the seldom-seen Louie perched atop Ella's downstairs changing table on Friday morning, taking a siesta in the morning sun. Anyone want to change his diaper? My great uncle is a very small man. He's about to turn 82 years old, about 5'5, and when he went for his yearly physical last week, he was told by his doctor that he weighed 108 pounds. He eats like a bird. He'll have crackers for breakfast, and then he'll seldom eat again until dinner time. I don't know how he manages to have such a small appetite, because the only way crackers would satisfy me until dinner would be if "a box of" preceeded the word. But my uncle does love his desserts. He researches dessert recipes meticulously, snipping them out of newspapers and magazines, and giving them to my great aunt to make, most of which she summarily dismisses as too complicated, too fussy, or simply because they aren't in the vast repertoire of recipes she knows by heart. Two weeks ago at Sunday dinner he slipped me a recipe for Autumn Gold Pumpkin Cake and hinted that he'd love it if I would make it for the following week's dinner. Pumpkin? Cake? I'm on it! And best of all, this recipe is as easy, breezy as you could ever ask for. It consists of a box cake mix, with a few extra ingredients thrown in for flavor. M said in a comment to my Pumpkin Pound Cake post that she only bakes from a box. Well, this is a box cake recipe that is moist, delicious, and super-easy to make. And my uncle loved it. 1. Preheat oven to 375 degrees. Grease and four 2 8-inch round cake pans. 2. Combine cake mix, eggs, water, pumpkin, cinnamon, ginger, and nutmeg in a large bowl and beat at medium speed for 4 minutes. 3. Pour batter into pans and bake for 30-35 minutes. Cool according to package instructions. 4. For the frosting, combine frosting and cinnamon. Stir until blended. Then fill and frost the cake. Everyone loves an Italian grandmother, right? She showers you with love and attention. She slips you money as you're headed out the door so you can "buy yourself a treat," even though you're now 30 years old, have a job, and can buy your own treats, and she encourages you to eat your weight in macaroni at Sunday dinners because "you're looking thin." That's my grandma to a T. She practically raised me growing up. We're super-close, and I love her to pieces. 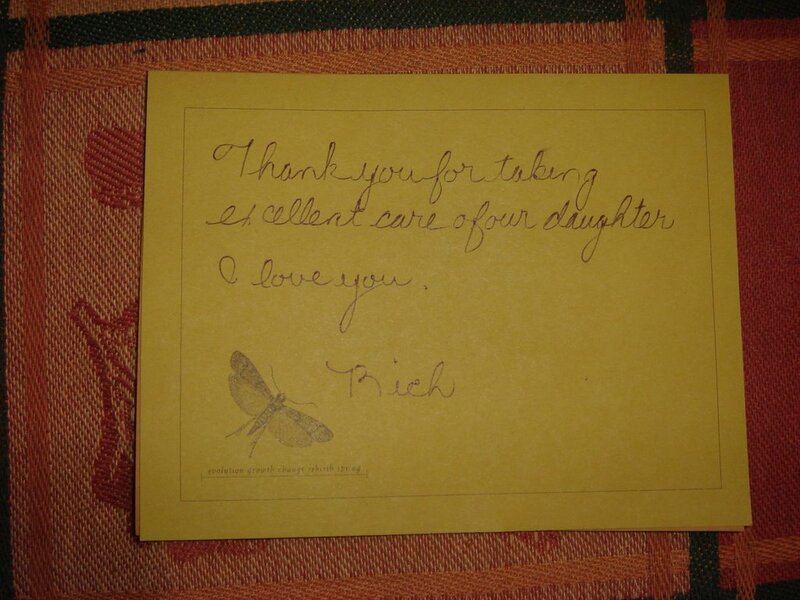 That said, I believe she fears I'm slowly killing her first great-grandchild with my lax parenting skills. 1.) 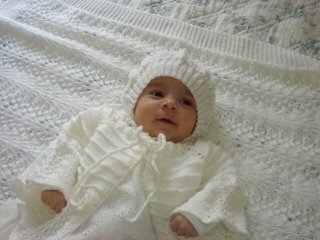 Babies should wear no less than five layers of clothing at all times. They should wear only sleepers for the first six months of their lives. No actual clothing. At all. Because it makes them uncomfortable. I have left Isabella with her while I've gone out for a run or to the store and upon my return, have found the babe, whom I left clad in a shirt and pants, decked out in one of the 10 or so sleepers she owns. When I ask grandma what happened, she's said Ella has peed or pooped on the pants, and she needed to change her. Inspection of aforementioned garments show no evidence of any such bodily fluid. 2.) Babies hands should be covered at all times because their hands are freezing. Also, they are likely to poke out an eye since they're constantly swiping at their faces. My grandma tells Isabella all the time, "Your mommy needs to cover your hands! They're so cold." Paranoid that I was slowly giving my baby frost bite, I looked up "cold hands" in my trusty "What To Expect The First Year" and found that babies' hands and feet are always cold because they direct most of their blood flow to their internal organs at the center of their body. So, just because their hands are cold, doesn't mean they are cold all over. Phew! And her eyeballs? Still safely lodged in her skull, thank you very much. 3.) Babies should be fed formula, not breastmilk, because that's what she fed all five of her kids, including my mother. Now, to be fair, she hasn't come right out and said this to me. But she'll make comments like, "I wonder if she's really satisfied after you're through nursing her?" and "Maybe you should give her a bottle of formula so you know how much she's eating." This one bugs me the most, because breastfeeding is a lot of work and I'm the only one capable of doing it for Ella. And having unsupportive family members (grandma isn't the only one) tell me I should be supplementing or worse yet, not breastfeeding at all irks me. It's a completely personal choice, but breastmilk really is what's best for babies. Plus, she's pooping, peeing, and gaining weight (9 pounds, 10 ounces as of last week! ), so I know my baby isn't growing up to look like an Olsen twin. 4.) Babies nails shouldn't be clipped until they are at least two years old. The first time I cut Ella's nails, I nicked her slightly under one nail with the infant clippers. I felt horrible about it. But my grandma I think, felt worse. The day after this incident occured, my great aunt brought over a baby nail clipping kit that contained a magnifying glass. Word travels fast in my family, you see. 5.) Babies shouldn't be taken out anywhere in public until they're old enough to walk there themselves because the germs! They are EVERYWHERE! And they WILL kill her. 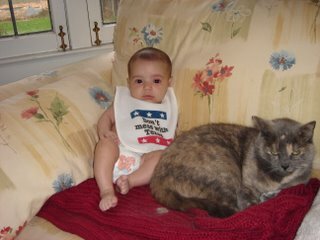 We started taking Ella out when she was about six weeks old. I take her to church, the store, restaurants, etc. I won't take her to hospitals and nursing homes because those places really are hotbeds of disease, but pretty much everywhere else is fair game. Grandma (and my mom) think this is assinine. Apparently, I'm supposed to stay holed up in my house with her until she's 11, and I've forgotten what the outside world looks like. Grandma and I are generations apart, and I know much has changed since she was raising her kids, my mom and my aunts and uncles. 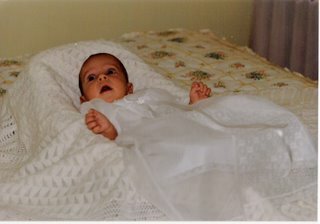 And really, much has changed since I was a baby as well. And grandma really does have a PhD in childcare. 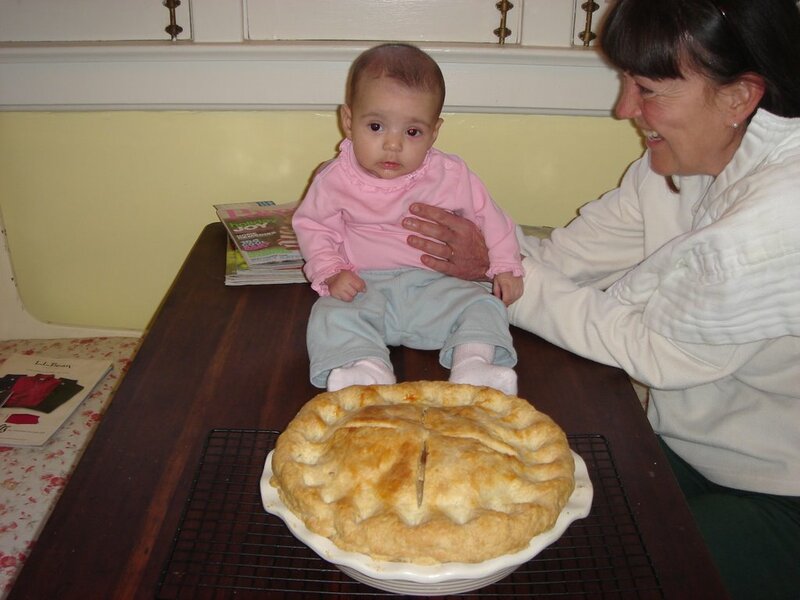 If I ever had a question about something Isabella was doing, I'm certain grandma would have the answer (of course, whether it was the right answer is up for debate). And she's fantastic with the little bean, who loves her great-grandma to pieces and sleeps calmly in her arms for hours. But there's a wee little part of me that goes a little off the deep end each time I hear that I'm doing something wrong in the motherhood department. I know that where babies are concerned, everyone's an expert, and since Ella's my first, I'm certainly not. But I think I'm doing a fairly good job. I mean, I've managed to keep her alive for 10 weeks now. That's gotta count for something, right? This week is National Infertility Awareness Week, and I'm embarrassed to say that if I hadn't read about it on Beagle's blog, I wouldn't have known. Since having Isabella, I've had at least one moment in every day, whether it's been when I'm changing her diaper and she's grinning her toothless smile up at me, or when I've put her in her swing, and she's contentedly chatting away to the people in the picture frames directly in front of her, or when I'm looking down at her soft little head as I nurse her, when I think how truly lucky I am to have her. I'll never forget the two years of infertility hell we went through to have our baby. I'll never forget how isolated infertility made me feel. How I did everything in my power to construct a baby-proof life for myself. How sad infertility made me, and how desperate for a baby of my own I really was. I'm a mom now. I got to push my stroller with my baby in it around a children's museum on Tuesday alongside hundreds of other mothers. I felt so oddly normal. I felt like I belonged there among the fertiles. I was just another mother. No one there (other than Marie) knew my story. And I was happy to blend in. But in other environments, ones that aren't dominated by mothers and their children, my feelings are different. Because whether we're in the grocery store, or the mall, or a restaurant, I know that there's likely someone suffering through what I went through, staring at me and desperately longing for what I have. I know because I was in their shoes. I did the same thing. And it's to those isolated women that I want to reach out and to tell them that Isabella did not come easily to me. That I went through two years of disappointment and thousands of dollars to have her. And to offer support, and the chance to share my story if it will offer them even one ounce of comfort. And that's where the Common Thread movement comes in. "For anyone who has ever had a miscarriage, struggled with pregnancy, and all things infertile...there is a movement upon us that you might want to join. It's rather simple actually: a discreet ribbon on your right wrist to signal to others that they are not alone in their struggles. The pomegranate-colored thread holds a two-fold purpose: to identify and create community between those experiencing infertility as well as create a starting point for a conversation. Women pregnant through any means, natural or A.R.T., families created through adoption or surrogacy, or couples trying to conceive during infertility or secondary infertility can wear the thread, identifying themselves to others in this silent community. At the same time, the string serves as a gateway to conversations about infertility when people inquire about its purpose. These conversations are imperative if we are ever to remove the social stigma attached to infertility.Tie on the thread because you’re not alone. Wear to make aware. Join us in starting this conversation about infertility by purchasingthis pomegranate-coloured thread (#814 by DMC) at any craft, knitting, or variety store such as Walmart or Target. Tie it on your right wrist. Notice it on others." I think this is a great idea. I plan on adding the Common Thread graphic to my sidebar* to get the word out, because even if you didn't have trouble conceiving, or you don't have children yourself, it's very likely that you know at least one person suffering through infertility. And if you can connect that person to someone who has been through what she's currently enduring, that might be just the help your friend needs. Isabella is a gift for which I will always be eternally grateful. And it's my greatest hope that my IF sisters, Thalia, and Hopeful Mother, and Beagle, are able to end their IF journeys soon and get to experience what I'm so blessed to have. I'm thinking of you three, this week especially. *So, can someone tell me how to add the following graphic to my sidebar? I can't figure it out. Hoosiergirl5 has issued me a challenge. And frankly it's one that I can definitely see myself failing to meet. But much like Tom Petty, I won't back down. I will stand my ground. And as a result I will try to post to my blog every day in the month of November as a participant in NaBloPoMo. I'm sure many of you have heard of NaNoWriMo (National Novel-Writing Month) where those with the free time I don't have attempt to write 50,000 words of a novel in one month. Yes, this was once an aspiration of mine. Unfortunately, that's on the shelf along with an uninterrupted night's sleep, the consumption of a hot dinner, and the chance that I'll actually take off a spitup- free shirt at the end of the day, since on or about August 22 of this year. NaBloPoMo (National Blog Posting Month) is for those who "lack the imagination, stamina, and self-destructive impulses required to write a novel that quickly," but who instead take the pledge to update their blogs once a day for the entire month of November. You can check out more information on it here. Since Isabella's birth I've been averaging about one post per week, which is, um, six less than are required for participation in NaBloPoMo. But, since frequent blogging is one of the things I desperately miss about my pre-motherhood life, I figure Hoosiergirl5's invitation is a divine intervention of sorts. I like a good challenge, so I'm going to give this one a shot. My posts in November may not always be coherent. Or relevant. Or interesting. Or even decipherable as English if the babe has had a particularly goulish night. But, assuming I don't fail miserably, Interrupted Wanderlust will have fresh content of some sort each day in November. And seriously, if that's not something to thank your lucky stars for this Thanksgiving, I don't know what is.